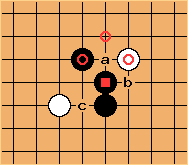 is the ear-cleaning tesuji, forcing Black to protect with a, b, c, or d.
is tesuji, Black uses it to help his weak group make shape while attacking White. Black goes on to win this game by resignation. Charles Great name - evocative. I've never encountered this before. Hope I never have to respond at a or b! Evpsych: Are c and d better? Floris: Well, c and d are certainly better shape but unless allowing White to stretch by playing them forcing me to make bamboo isn't a good exchange for White (it certainly makes White stronger) I would find it quite hard to decide where to play. Charles Looking at the shape issue here, there are a few points to be made. If you look at , and , you see that sits on the 'angle'; even if Black plays the circled point, no eye here. This shape would therefore be better for Black with at a, weakening . This shape would be even better with at a. In that case, we probably do have White b, Black c in the near future for a bamboo joint; but this is strong for Black, who can then move out easily in several directions. Evpsych: I take that as a yes (?). My 11k idea was that the kosumi is stronger because an attempted cut seems to gain less for White than an attempted cut of the alternative shape. OTOH, shape is probably more important. Charles Context is, as usual, important. Assume first White is attacking here. 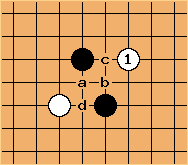 Then White's attempts to cut are irrelevant (won't happen any time soon) - but Black presumably must connect somehow. In that case the connection with is shapeless. If on the other hand White is on the defensive you perhaps look longer at White's forcing plays. But then wouldn't be played this way, in most cases. White normally gets more by playing at . OmnipotentEntity? : I recently saw a pro game ( http://www.youtube.com/watch?feature=player_detailpage&v=mNwErm_jf38#t=2995) where Lee Sedol played this tesuji against Tang Weixing. Tang responded with a. Is this another possible answer in the general case? Or is this situational?